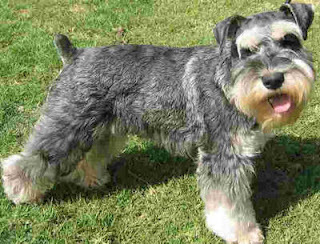 The Schnauzer Standard is bred in Germany, this breed is the oldest breed among all three Schnauzer dog breeds. This is a working class breed which was used as a protector and guard dog. This dog breed is best to protect cattle and sheep, now a days this breed is used as a watchdog also but they are very rare. This breed is very intelligent and also known as the dog with a human brain, they are brave agile and bold, this breed is very good as a family breed and do well with other pets. This breed of dogs is very loyal to their family and masters. They are very intelligent and do their job perfectly, they are good with older people and children and are very good as a house dog. They are very sensitive regarding their feelings with their masters, they will become aggressive and destructive if they left alone for some period of time. They are very alert and suspicious of strangers they can protect their family and territory which make one of the best dog breeds. This breed of dogs has a double coat, the outer coat is thick wiry and hard where as the undercoat is soft and dense. The color of the coat is either pure black or salt and pepper. This breed sheds little to no hair. This dog breed is very demanding and needs a dominant owner. They are not good for the first time owner, this dog breed requires early socialization and obedience training. Training should be given with fairness and patience, they will not respond to any hard and harsh methods of training. The best Standard Schnauzer is very energetic breed which requires lots of exercise, they love to go for jogging and enjoy family play sessions. They will do ok in apartments and do best in rural settings with a job to do. This breed of dog needs regular brushing to avoid dead hair and dirt. Bathing should be given to them when needed. The Standard Schnauzer is generally healthy but may be prone to minor eye problems and hip dysplasia, it is also prone to tumors. The average lifespan of the Schnauzer, Standard is about 15 years.